UC San Diego senior pitchers Tim Shibuya and Guido Knudson were both drafted Tuesday on the second day of the 2011 Major League Baseball First-Year Player Draft. Shibuya, a 6-foot-1-inch, 190-pound right-hander, was selected by the Minnesota Twins in the 23rd round as the 718th overall pick. 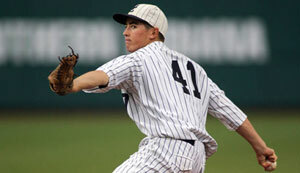 Knudson, a 6-foot-1-inch, 180-pound righty, was taken by the Detroit Tigers in the 28th round, the 857th overall pick. "Tim and Guido are outstanding ball players who will go on to make their organizations very proud," said UCSD head coach Dan O'Brien. "But, they're even better people who have already made us so proud of their success, on and off the field." The all-time wins, strikeouts and innings pitched leader at UCSD, Shibuya was 11-4 with a 2.12 earned run average in 2011. He struck out 109 batters, his highest single season total as a Triton, and three times he fanned a career-high 11. He led the California Collegiate Athletic Association (CCAA) in wins, strikeouts and innings pitched and was second in ERA and opponent average en route to being selected the consensus West Region Pitcher of the Year. The Jackson, Wyo., native won 40 games over his Triton career, including a school record 13 in 2010, and earned All-American status in three of his four seasons at UCSD. Shibuya said he found he had been selected by the Minnesota Twins when his friends started texting him. He was quick to give credit to those who helped him find success. "It’s an incredible feeling and I’m thankful to both the university and the coaches at UCSD for putting me in position to pursue one of my dreams," he said. Meanwhile, Knudson said he was taking a final when the call came in from the Tigers, so he didn't find out about it until after he came out of class. Knudson said being picked up by a major league deam is a dream come true. "Professional baseball is definitely something I’ve always wanted to do—it’s been a goal since I was a little kid." Knudson finished his Triton career with a 29-12 record and a 3.63 ERA. 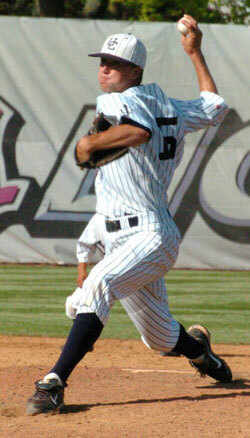 An All-West and All-CCAA performer in 2011, he registered a career best 2.80 ERA with a 9-3 record. At one point this season, Knudson won five consecutive starts. In 2010, he won 10 games and in 2009 he saved 10 games. "Not many programs have had two players drafted in the same day who are chemistry (Shibuya) and engineering (Knudson) majors," said O'Brien. "It's an incredible accomplishment by two outstanding young men and a very proud day for Triton baseball!" 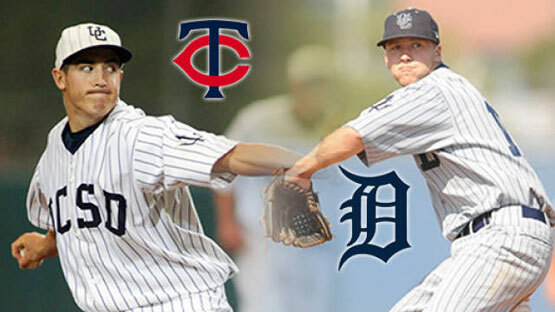 Shibuya and Knudson are the first MLB Draft selections to come out of UCSD since 2003. Alex Cremidan, also a right-handed hurler, was taken by the Arizona Diamondbacks in the 35th round (1056th overall pick) of that year's draft. Cremidan played three seasons of Rookie and A ball for Arizona.